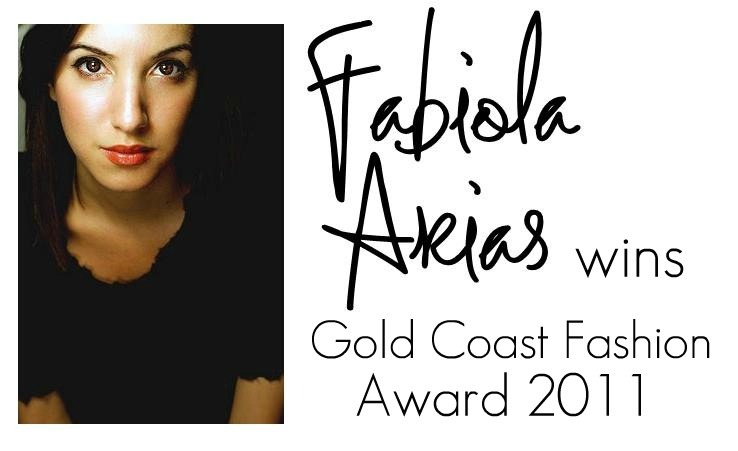 Fabiola Arias has won The Gold Coast Fashion Award for best designer. Previous Gold Coast winners have included Bibhu Mohapatra in 2010, Angel Sanchez in '96, and Donna Karan in '88. Earlier this year, Fabiola received Fashion Group International's Rising Star Award for women's wear. Fabiola Arias is a manifestation of the artistic background of its designer. Fabiola's unique and signature use of texture and surface treatment is visible in her cocktail and evening wear pieces. The dissatisfaction from common fabrics inspire Arias to experiment, cut, twist, pleat, shred, scratch, distress and collage plain fabrics to look like complete works of art. When she was studying at Parsons the New School for Design, Fabiola decided to launch her own line which was initially picked up by Ikram in Chicago. Fabiola Arias' Fall 2011 collection can be bought at the Neiman Marcus Couture Salon across the country.